The Pad Thai (S$7+) is served with generous portions of fried beancurd, prawns, beansprouts and spring onion. This aromatic stir-fried noodle dish is a good mixture of sweet and salty flavours and is a classic Thai favourite that we enjoyed very much. Served boiling hot, Green Curry Chicken (S$12+) is rich and creamy and hit all the right notes for us. 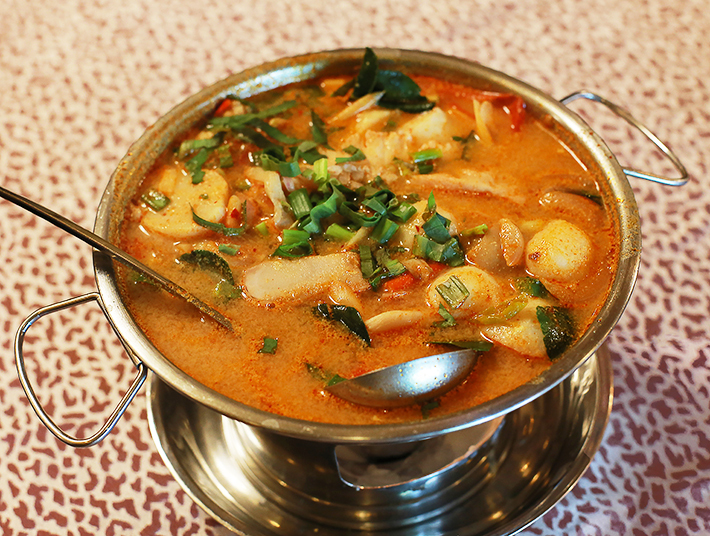 We are saving the best for the last—Beerthai House Restaurant’s Tom Yum Soup (S$12+) was a favourite among all the dishes that we had tried. The soup was generously cooked with ingredients which included sliced fish, fish balls, mushrooms and prawns. The eatery also offers Assorted Thai Cakes, Sweet Tapioca, Red Ruby and Mango with Sticky Rice for desserts.